I've always wanted to go the ATT Pro-Am (formerly the Clambake) and this year I decided to get myself to Monterey. This is part 1 of my adventure up there, enjoy! 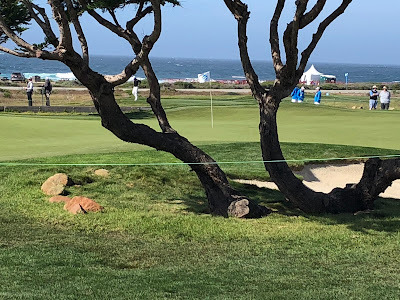 One of the great things about the Pro-Am is that it is played on three golf courses instead of just the standard one for most tournaments. 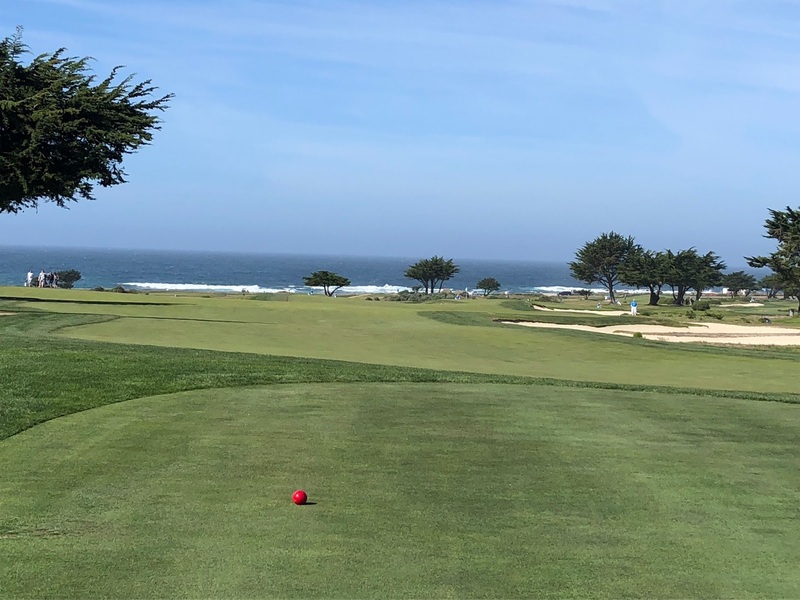 Each day players get to play either Pebble, Spyglass or a third private course. This private course over the last few years has been MPCC, a 36 gem right in the heart of Monterey. 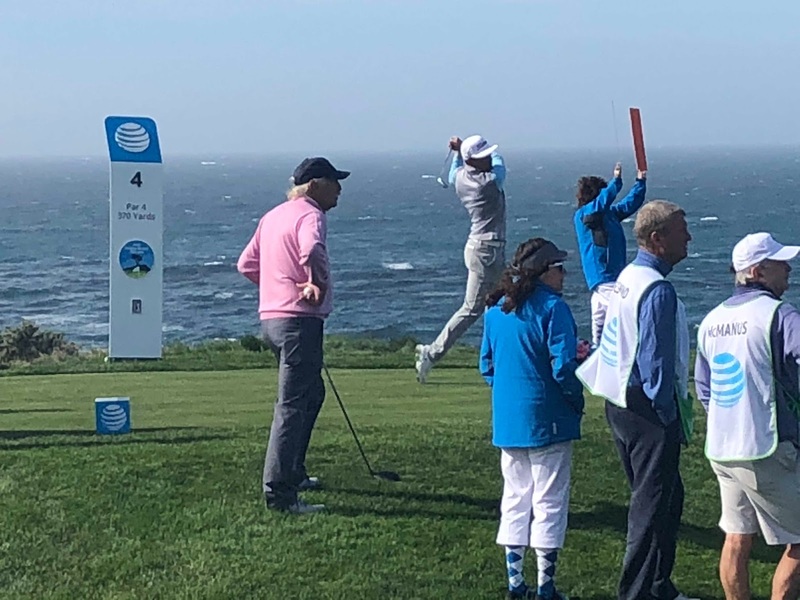 MPCC's Shore Course is a fascinating track which is schizophrenic in the best possible way. 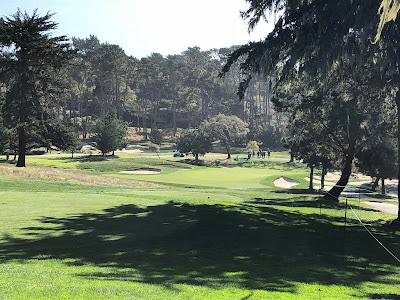 Several of the holes flow up and down the hills of Monterey and are sculpted within an inch of their lives. This is the Augusta-like portion of the property. The deer run rampant as this is the most lush parkland setting you can imagine. Once you get off the hill and down by the Shore, the course turns into a gorgeous dunescape of holes running West to East. While much more rugged than its brothers on the hill, the ocean portion of the holes also has impeccable landscaping which kinda leads to an Augusta on the Shore type of vibe. 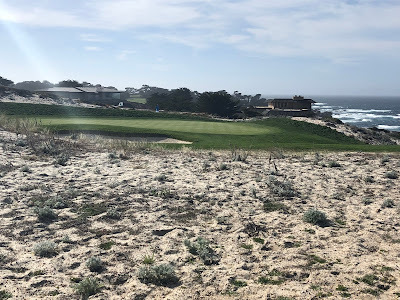 If I were lucky enough to be a member here, I would just put myself on a continuous loop walking these shore courses, the views were spectacular! Walking around this place, the vibe was unlike any other I have experienced watching tournament golf. 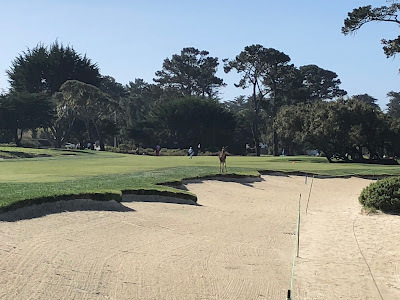 Most private courses that host tournaments recognize that golf fans are there not just to check out the pros but the club itself (Riviera is a great example) but MPCC definitely kept itself at a distance. 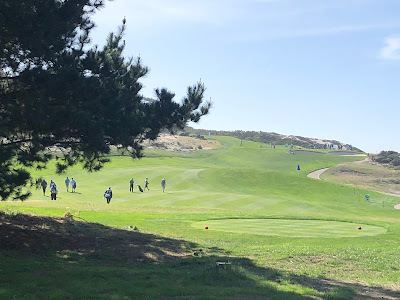 There were several members only portions of the property that you couldn't access and there was almost no food and beverage options (a couple of food trucks and beer tent by the entrance but otherwise if you were anywhere else on the course, good luck finding any amenities). It was very much a "look but don't touch" vibe which while I understand in the abstract, causes unnecessary hardship on the people watching the tourney. 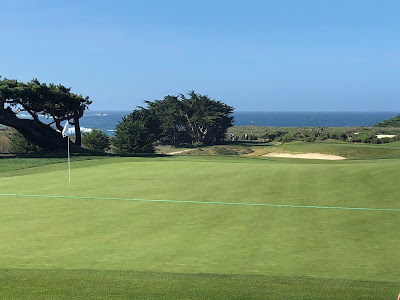 That being said, MPCC lives up to the hype, the shore holes are fantastic and the Augusta-like holes are pretty and serene. I would love to be a member here! 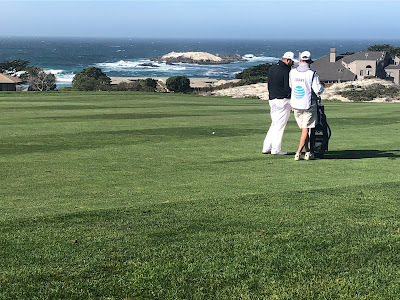 Spyglass doesn't get the love its sister course Pebble does but woah nelly is it a tough test of golf. The very first hole gives you a taste of what you are in for with a huge downhill par 5 with a crazy elevation loss leading to a sweeping dogleg left then ending with an elevate green. Just the scale of this first hole would make any fan of golf architecture go insane. The fact that you eventually have to play back up this hill to the clubhouse is even crazier! The true standout holes at Spyglass are holes 2-5 which are near the ocean but not quite. The second hole is a gorgeous par 4 with a tight drive through the trees leading to a wideish fairway and then an uphill green. 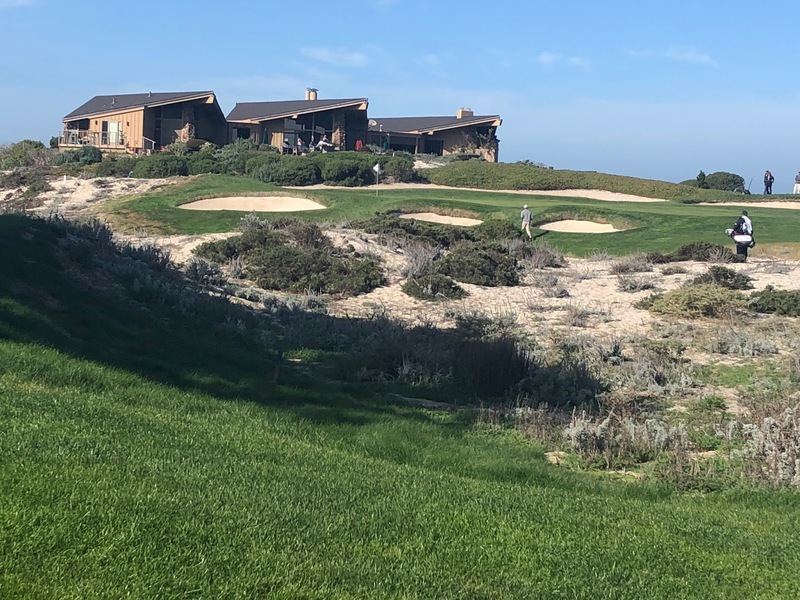 The next hole is a beautiful downhill par 3, very reminiscent of the 7th at Pebble but with much more wild dunescape to get you into trouble. Truth be told, this is one of my favorite holes on any of the Pebble Beach Resort courses and it comes so early in the round! Next up is the par 4 with one of the most stunning backdrops in golf. You then cross the road for another par 3, this time a beautiful uphill one shotter and despite the houses, has an amazing wild quality about it. 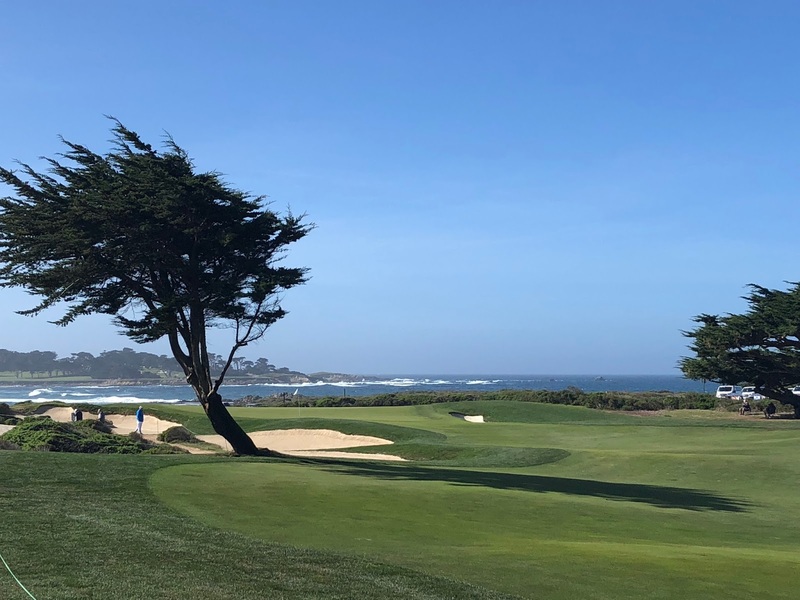 Of course, the one other amazing thing about this stretch of golf is that you get views of Cypress Point Club which is almost worth it just for that. Spyglass is absolutely over the top in terms of topography and design but I loved it. They say that Spyglass should be the course the US Open is played on and I don't think they are wrong, it is a beast (in the best possible way!). Look out for Part 2 of my Pro-Am adventure this Thursday!